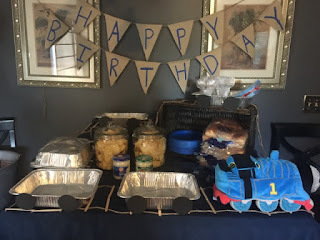 When I was going through my archives I noticed I did not share with you my little man's 2nd birthday party. 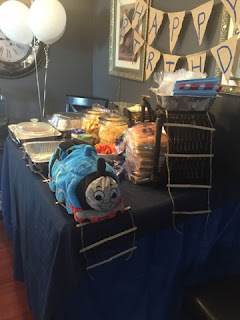 It was one of my biggest parties I have ever hosted and it was one of the funniest. Since it was a little boys party I wanted to do a candy buffet table. 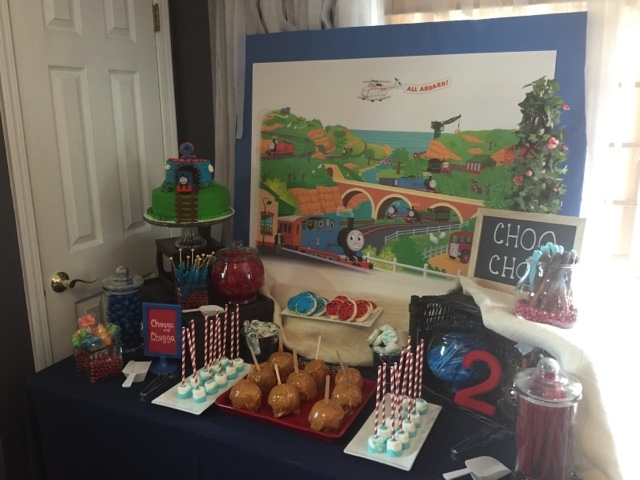 This was my first candy table and I did not realize how much candy and sweets it would take to fill the table. Did you notice I did not mention a word about the price? A year later I am still in shock. 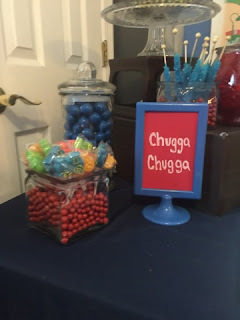 Candy tables are expensive to do, even when you buy in bulk and especially when you have to buy all the glass containers to hold the candy. 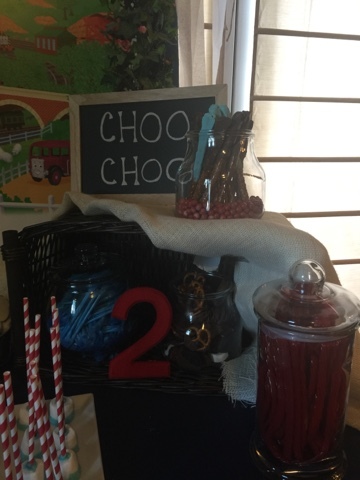 The candy buffet was a hit. Everyone loved it. But I had candy by the galore left. Here is a few of my favorite pictures from the candy / sweets table. One thing I did not like was that my candy apples was not straight. But that is life. I have to give a shout out to one of my good friends. 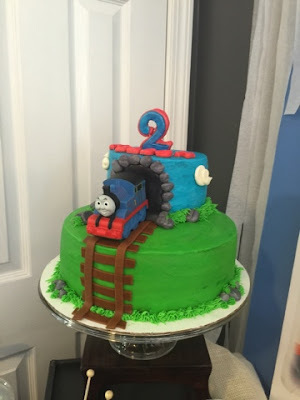 She made the cake and the cake looked awesome. Thank you so much Jaclyn. If you live in the Louisville area and are in need of a cake , email me and I will send you her contact information. On another table I had the food. When I throw a party we like to eat. I serve lunch and then cake and ice cream. I served bbq, chips, and potato salad. In each of the pans I placed the food. 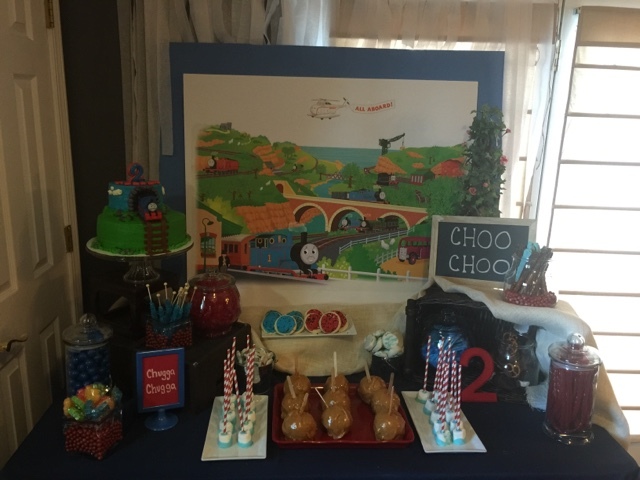 I loved how I made the pans look like part of the train. 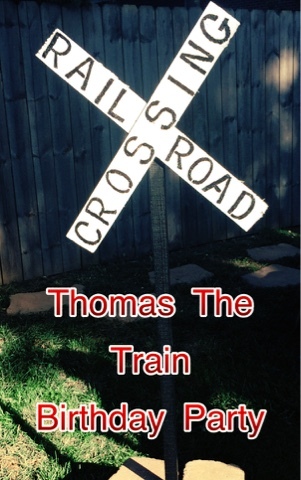 If you look closely you will that the train is on tracks that I made. 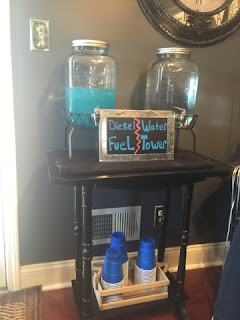 A train party is not complete with out diesel fuel and a water tower. 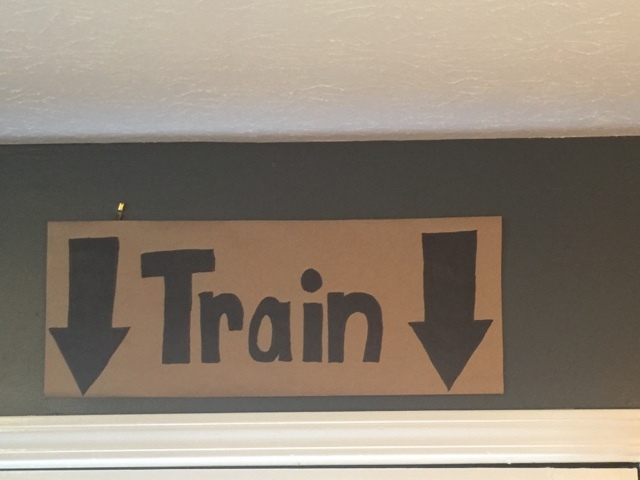 On the way out from the kitchen to our back yard I made this cute sign. 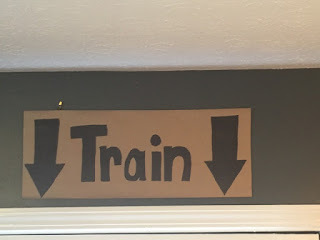 I wanted it to resemble being in a train terminal and the sign saying train this way. 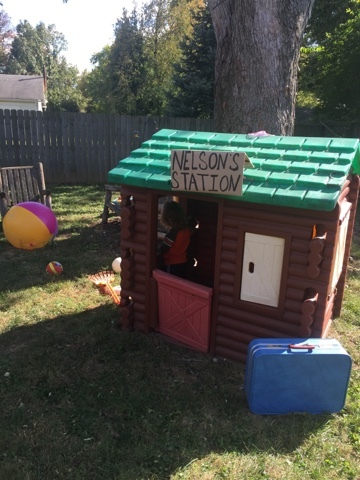 On the other side of the door there was a sign that said train depot. I must have not got a picture of that sign, because I can not find it. 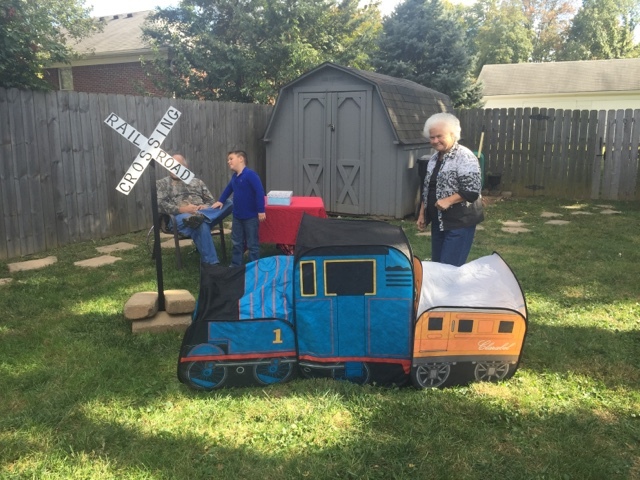 We even had a train that the kids played in and a railroad crossing sign. 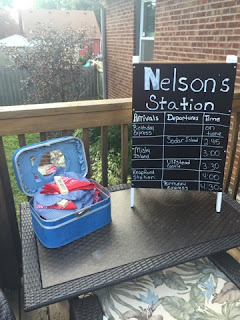 I also placed a sign on the log cabin we have outside and placed a suitcase beside it. The kids loved it. 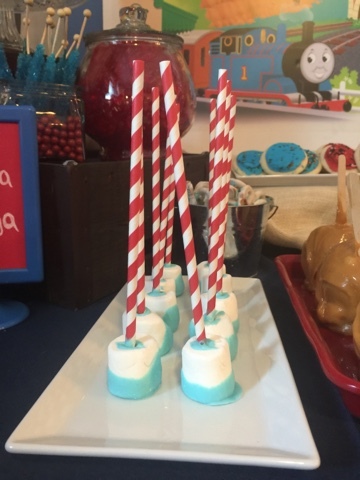 Each child got a conductor hat, red bandanna, and a wooden train whistle. Before you go out and buy train whistles, please listen to me. Wooden train whistles do not sound, unless they are the expensive ones. I was thankful that the weather was not to cold. 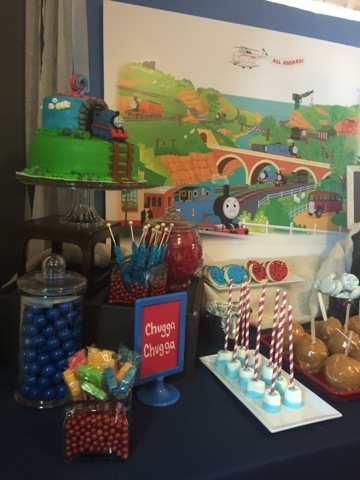 Have you been to or hosted a Thomas The Train Party?